Now on its 8th year, Lakbay Norte once again concluded a media familiarization tour participated by travel writers from online and print publications. It is organized by the North Philippines Visitors Bureau in partnership with Victory Liner as a way of promoting Northern Luzon as a premier tourist destination. This year's itinerary took the more than 20 travel writers and photographers to the places of Subic and Clark in Pampanga and to the surfing town of Baler in Aurora. Here’s a quick rundown of all the places highlighted by #LakbayNorte8 as possible destinations for travelers heading to this part of Luzon. Aimed to erase the stigma of Angeles City as a red-light district, the LGU spearheaded efforts to highlight the city’s heritage district. The result of this transformation gave history enthusiasts a big reason to visit this part of Pampanga. Start your learning exploration at the Pamintuan Mansion - Built in the late 19th century by Mariano Pamintuan and Valentino Torres, it became the living headquarters of General Arthur MacArthur and General Antonio Luna. This is also where the Philippine Independence was first declared. A glamping spot away from the beach or the mountains is made possible by the planners behind El Kabayo Glamping and Picnic Grounds. 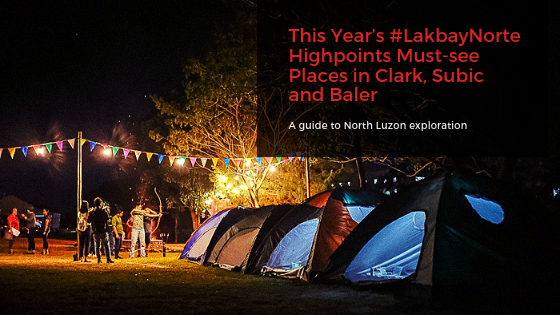 Situated in a vast patch of lawn-covered lot inside Clark Freeport Zone, it provides an ideal camping spot where friends and families can bond under the starry skies. Glamping package consists of tents with mattresses, a food spread of cold cuts, cheese, fresh fruits, sliced hams and wines. Other activities include conversations over a bonfire, archery and horseback riding. Fusing together hiking the great outdoors and community immersion is the main mission of Mad Travel. Through their Tribes and Treks tours, they bring guests to the forested home of the Pastolan tribe of the Aetas. During the hike, Aeta guides share their skills in carving cooking instruments and utensils from a bamboo as well as starting fire to cook food. Other activities involves tree planting plus guests are lectured on the many ways one can help preserve the forest. One of the biggest water theme parks in Asia, Aqua Planet boast of 38 thrilling slides and attractions including the tornado - a four person lifebuoy ride and the aqua loop - a vertical drop slide that launches you into numerous loop. If you don't fancy the thrills, you can always chill by the wave pool and enjoy the sun at the many cabanas in the park. This mini-zoo and theme park in Clark showcases a Night Owl Show every evening. The spectacle culminates in a dazzling display of lights, Jabbawockeez-like choreography and a scintillating fire dance routine performed by members of the Aeta community. They also host a Dinner in the Dark as a way of honoring and helping their blind massage therapists by donating proceeds from the dinner to their organizations. We capped the second day of Lakbay Norte 8 at the Subic Yacht Club where we tried the services of SAGS Subic Sailing. They offer sailing tours for visitors wanting to enjoy the scenic views of Subic Bay. This is a perfect activity for couples wanting to enjoy a romantic time together – especially during a sunset cruise when the sky and scenery turns notches more dreamy. This 50-meter high waterfalls is also known as “Mother Falls”. It is Baler’s must-visit nature attraction because it only requires half hour hike over an easy trail that knifes through a mountain parallel to the massive pipes of a hydraulic plant. The waterfalls’ wide basin surrounded by massive boulders is suitable for a refreshing dip – especially after a surfing session. Baler town boast of a number of heritage and historic sites such as the San Luis Obispo de Tolosa Church, which was where the "Siege of Baler" happened in 1898. A short walk away is the Museo de Baler - which houses an impressive collection of historic artifacts. Also located within the area, is the replica of the childhood home of Dona Aurora Aragon Quezon, the wife of President Manuel Quezon. As our boatman tells us “15 minutes and one hour” away from Cemento Beach, situates an isolated cove surrounded by rolling hills and jagged rock formations. A long stretch of fine white sands comprises the shore line of Discalarin Cove. Stretch out on the edge of your boat, then take some photographs before taking a dip and dive at the crystal clear blue waters. A few kilometers from the surfing haven of Sabang Beach, the waters at SeaSta Beach Resort not only caters to advanced surfers, it also serves as the playground of adventure outfitter, Buoyancy Water Sports. They offer a number of speedboat-towed inflatable rides such as the chill Banana Boat, the mildly wild UFO couch that can sit up to eight people and the electrifying Flying Fish. These thrilling activities are a good option to balance out the stoked feeling of surfing the waves in Baler. Of course, nobody departs the town of Baler without riding a surfboard. After the joyful feeling from plunging at the great outdoor wonders of Baler dwindles, surrendering to the lure of the waves and the feeling of getting stoked becomes a must. There is no better way to end one’s Baler trip than playing with the waves and let Colonel Kilgore know that “Every Juan can surf”. Lakbay Norte 8 Familiarization Tour was organized by North Philippines Visitors Bureau(NPVB) and NLEX Corporation.